United Vending is proud to offer our customers a water cooler service at a special rental price of £5 per week when ordering a free on loan vending machine. 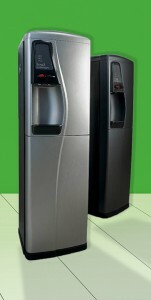 For a standalone service, our water cooler rental price is just £9 per week. Below is one of our more popular water coolers but we stock a broad range of machines to suit all requirements. Enquire today and discover how we can service your company. We take every measure to offer outstanding service to our customers. Included in the rental price is installation, sanitisations, filter change and full breakdown cover. Freestanding, chilled and ambient, our Borg & Overstorm water coolers offer refreshment on demand. An in line filter system fitted inside the machine filters and stores 3.2 litres of cold water so your customers and employees can enjoy cold water right away. An adjustable water block protection device automatically switches water flow, while a removable drip tray helps avoid spillage. United Vending have over 15 years' experience offering free vending machines in and around London. We pride ourselves on great customer service and products.